Peter McFadyen has produced a special anniversary book to mark a decade of the Owner Driver Mechanic Awards. Published in 10 x 8” in hardback with a dust jacket, it has 116 pages and over 200 photographs of the cars and drivers who have competed in the ODM since its inception in 2009: if you have raced in the awards series you are almost certain to find that you are featured. The book can be ordered direct from Peter on his website www.petermcfadyen.co.uk at a cost of £45 plus £3 p+p to UK addresses. Copies will be available for inspection at Silverstone on 13th April 2019 (VSCC Formula Vintage Round 1) in the ODM marquee. Tim Kneller has won the 2018 ODM Award competing in his Riley TT Sprite Replica. After taking 3rd in class at Silverstone, Tim managed to take 1st in class at Oulton Park (where he was also 1st overall), Donington, Cadwell, Mallory Park and Snetterton: a convincing performance through the season. Ian Standing came second in his Riley Brooklands, having been ahead of Tim in the points up to Mallory Park, when mechanical problems intervened; 2017 winner Simon Edwards in his Morgan Super Aero finished a creditable third. Tim commented: “I have been fortunate enough to have competed in the ODM since John conceived it ten years ago, initially through the great generosity of John Collins who lent me his wonderful Riley Brooklands and latterly in my Riley TT Sprite. As his "works driver” I helped John to win the trophy in 2014, so after a successful season, it was great to finally win the trophy in my own car. Whilst it’s lovely to win, it’s a great privilege to take part in the best historic racing series bar none, all thanks to the indefatigable John Guyatt. Fortunately, we have a very sturdy sideboard in our dining room, so I am delighted to have the most interesting trophy in the Club to grace it”. Tim Wadsworth was presented with the ‘Golden Oldie’ Award, having supported the ODM since it’s inception and having raced for more than 50 years: John Fack with a special citation for his, Jerome and Maxine’s marvellous provision (again since the ODM inception) of the ODM marquee, which provides such welcome shelter and a focus for Set 3 at every event. 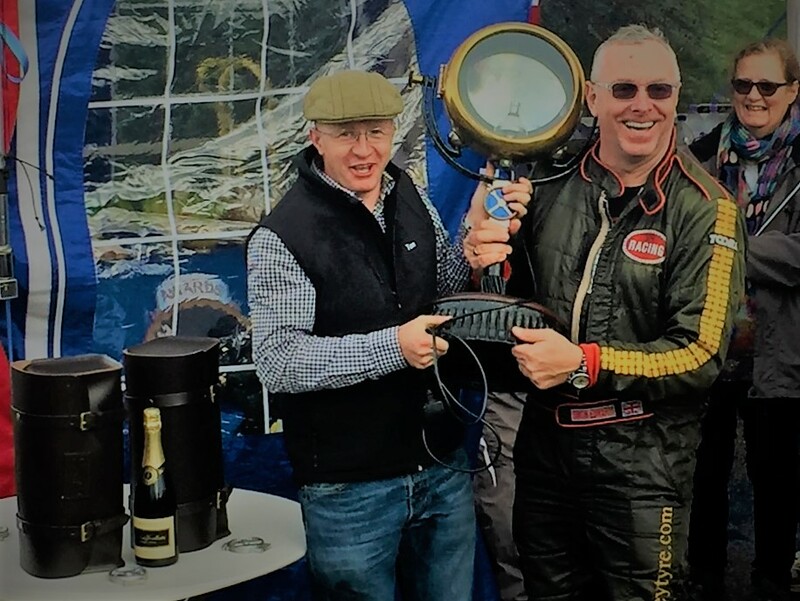 The class winners were presented with splendid photographs of their cars in action during 2018 and also with bottles of wine: special thanks to Peter McFadyen and Tom Hardman, as ever, for their support and generosity. Many congratulations to Tom Waterfield for a convincing win on his debut drive at Donington! Entries are open for the Castle Combe Classic on 1st October to include a 20 minute invitation race for VSCC Set 3 competitors. With seven races the fabulous cars speak for themselves, with a mixture of vintage sports cars to sixties single-seaters in the shape of the popular Formula Juniors. Featuring the GT and Sports cars which are new to the Autumn Classic, while the crowd-pleasing 500cc Formula 3 cars return once more. Add in pre-66 Jaguars and a huge grid of 1950s sports cars for the Inter-marque race and demonstrations of historic Grand Prix cars and you have a full afternoon. Enter on the VSCC web site. Our heartfelt thanks are due to Peter for his outstanding support of the ODM in 2017, providing most of our web site photographs for the VSCC Formula Vintage Set 3 races. All photograph credits are hyperlinked to their respective web sites, but do visit Peter's site at www.petermcfadyen.co.uk to see an extensive range of photos from VSCC and other motorsport events, including his 'Vintage Year' books which feature a wide range of VSCC race, speed and trial meetings. In Class 1: Simon Edwards (Morgan) moves into the lead with 44 points, closely followed by John Reeve (Riley Brooklands) with 39 pts and Duncan Potter (MG Montlhery Midget) 33 pts. In Class 2: Tim Kneller (Riley Sprite), lying in 2nd position, improves his score to 54 points, putting him within striking distance of Class leader Andrew Mitchell (HRG) on 60 pts. Charles Gillett, the owner and mechanic of the Frazer Nash SS driven by Ed Williams and Robert Moore moves up into 3rd place with 39 pts, while Sue Darbyshire now lies a close 4th with 35 pts. In Class 3: David Ozanne (Aston Martin) retakes the lead with 33 points ahead of Tim Wadsworth in 2nd with 31 pts and John Polson (Talbot 105) still on 27 pts. In Class 4: Mark Brett (Ballamy Ford) leads, but due to the high attrition rate any outcome is possible when the 2017 Award winners are revealed at Snetterton. Andrew Mitchell leads overall, but with Tim Kneller in close contention, all is to play for in the final round of Formula Vintage. The Automobile has kindly sponsored the ODM Awards in 2016 by giving our four Class Winners an annual subscription to the pre-eminent magazine dedicated specifically to earlier cars. This is undoubtedly the best magazine on the market for vintagents, featuring our sort of cars, and we're extremely grateful for this kind gesture of support from such an important publication. The lucky recipients are Duncan Potter, Mark Groves, Nick Rossi and Mike Preston. Read more about the Automobile. Duncan Potter took the 2016 Owner Driver Mechanic title following a consistent performance throughout the season in his 1931 MG Montlhery Midget, a car with a pre-war history referenced in Bill Boddy's 'Brooklands: The Complete Motor Racing History'. Duncan has raced in Set 3 for several seasons in the fiercely competitive under 100cc class, and was placed second in the 2015 competition. Runner-up and leader of the 1101-1500cc Class was Mark Groves in the Frazer Nash Emeryson TT Rep and third place went to Mike Preston, leader for most of the season in his Bugatti Type 35B and winner of the Over 3001cc Class, but absent for the season finale. Duncan said 'It has been a real pleasure racing in the ODM series this year and I am delighted to win motor sport's most recognisable trophy. The season has been great fun from start to finish. The ODM is a special thing, great camaraderie and friendship, sensible but competitive racing and excellent management from our patrons, John and Leslie. I can't wait to get the MG back on the track next year.' Read more on the VSCC web site. In a new initiative for 2016, the 'Golden Oldie' trophy has been introduced to recognise the elder statesmen of Set 3, and to celebrate lifelong racers who continue to set an outstanding example to a younger generation of competitors. The award was presented to octogenarian Cyril Hancock, a most popular choice, who has raced in Set 3 since its inception in his Fiat New Balilla. Cyril was delighted to be recognised in this way and said 'I'm already looking forward to nominating next year's winner!' Cyril is always supported at race meetings by his wife Helen and no mention would be complete without our thanks for her company and support at the ODM hospitality marquee. Pembrey was the penultimate meeting of the VSCC race season, so competition for the ODM Awards is hotting up … it will be down to the chequered flag at Mallory on 24th September! In the Under 1100cc Class, Duncan Potter has built up an unassailable lead, but 2nd and 3rd places could be anyone’s: Andrew Morland (MG PA) currently has 33 points, Simon Edwards (Morgan Aero) 32 and David Lamb (Riley Brooklands) 31. In Class 2, Mark Groves (Frazer Nash Emeryson) now lies ahead of Simon Blakeney-Edwards (Frazer Nash SS) and Andrew Mitchell (HRG). Class 3 (1501cc- 3000cc) is wide open with class leader Nick Rossi (1750 Alfa) off the road since breaking a half-shaft at Chateau Impney Hill Climb and Norman Pemberton, usually a strong contender, obliged to miss the last two races on account of his ‘golf handicap’. In the Over 3 Litre Class, Mike Preston (Bugatti Type 35B) is way out in front with Mark Brett (Ballamy Ford) and Anthony Fenwick-Wilson (Railton) currently lying 2nd and 3rd. All eyes are on the contest for the ODM Trophy: Duncan Potter has now closed the gap on Mike Preston to just 4 points and Mark Groves remains in contention 9 points behind. The Awards Ceremony will take place in the ODM marquee at Mallory, so do all come along to discover the outcome! 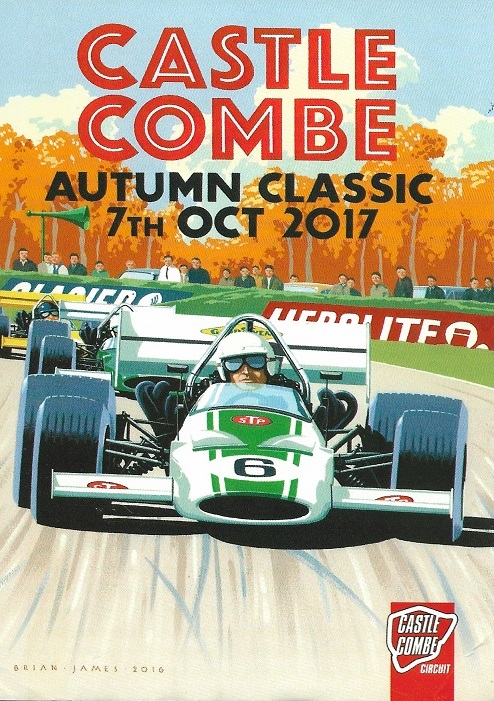 Entries are open for the Castle Combe Classic on 1st October to include a 20 minute invitation race for VSCC Set 3 competitors. With eight races, the cars speak for themselves, from vintage sports cars to sixties Formula Juniors. The 'Big Healeys' will be as competitive as ever while the crowd-pleasing 500cc Formula 3 cars return once more. Pre-66 Jaguars, historic saloons, a huge grid of 1950s sports cars for the Inter-Marque race and demonstrations of historic Grand Prix cars complete a wonderful line-up as the whole circuit steps back in time, with numerous club stands, displays and period style aplenty. Enter on the VSCC web site.